In a large stock pot, add hot water. Pour contents of Brown Gravy Mix (14 oz) into water while stirring with a wire whip or with mixer on low speed. 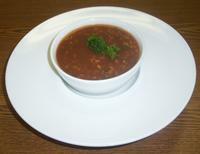 Continue stirring until mix is completely dissolved and gravy is smooth in body. Mix in tomato paste and basil. Option: add 1 lb cooked pearl pasta or lentils.